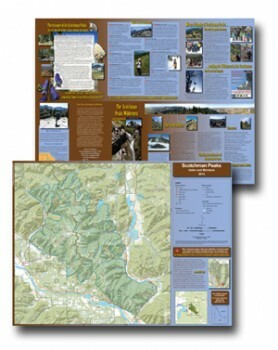 The Friends of Scotchman Peaks wish to thank the Idaho Conservation League for their help and support in producing these new high-quality maps. This full-color, shaded relief, topographic map shows maintained trails and trail head access routes on one side. The other side of the map has information designed to inspire as well as assist in trip planning. We strongly encourage anyone who is considering hiking in this rugged roadless area pick up one of these free maps to take along. Remember, the maps are FREE, but while you’re there, why not pick up a great Scotchmans T-Shirt or Hoodie to take hiking with you….your purchase helps us in our efforts to achieve the wilderness designation that the Scotchmans deserve! Great for research! 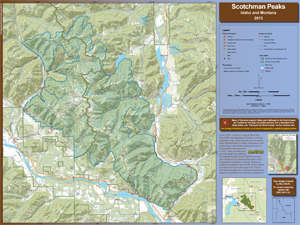 => Online Topographical Map centered on the Scotchman Peaks area – very detailed and you can zoom in and out, but if you want a printed copy to take with you we recommend picking one up (above) or downloading and printing one (below). You can use the download links below to view your map onscreen or print a copy of the map if you prefer.